The Northern Cardinal (Cardinalis cardinalis), also known as the "redbird" or "Virginia nightingale", is a territorial song bird. The Cardinal bird's range covers large parts of the United States of America, Canada, Mexico, Guatemala and Belize. Additionally, Cardinal birds have also been introduced to Bermuda. The name of "Cardinal bird" was inspired by the red robes of the Roman Catholic Cardinals - the bird's color is said to resemble the color of the robes. Additionally, the crest on the Cardinal bird's head has been said to resemble a bishop's mitre. 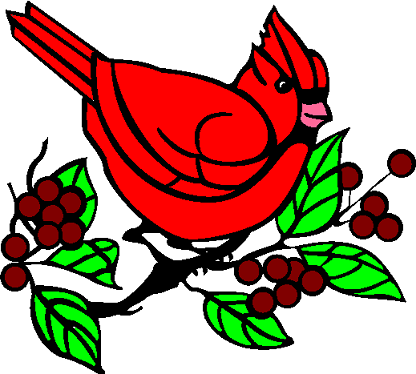 In the United States of America, the Cardinal bird is often associated with the Christmas season, and appears on many Christmas cards and decorations.